Put on a VYCC green uniform and help us change the world. Our Vermont Farm and Conservation Crews spend the summer and fall growing food for those in need and improving the health and accessibility of the outdoors. Apply Today! Apps are due April 15, 2019. We are looking for young people ages 18-26, to work: on our Farm Crews in Richmond or our Conservation camping (Spike) Crews across Vermont. Get paid to work outside for 8 weeks between June and August, for 8 weeks from September until October, or for both seasons, June until October. Make a lasting contribution to public lands or help supply food to hungry neighbors throughout Vermont. Serving as a VYCC Corps Member is a unique opportunity to work, travel, and make a difference. Young adults join crews of 6-8 Crew Members, 2 Crew Leaders and can either camp near their work site on a Conservation Spike Crew or live at home and come to work during the day on our Farm. Crews are co-ed and consist of up to eight Corps Members who come together from all walks of life to build strong bonds with each other and the surrounding environment. In addition to the projects, each workday holds many opportunities for building technical skills, exploring diverse perspectives during WoRD, gaining job and career building skills, and learning about the natural world. Corps Members develop leadership skills through a variety of hands-on activities. AmeriCorps Crews and General Young Adult Spike Crews are for young adults, age 18-24 years old, and focus on specific projects: the Parks Restoration Crew offers carpentry experiences; the Assessment Crew studies erosion and trail conditions; and the US Forest Service Crew improves trails, campgrounds, and ecosystems throughout the Green Mountain National Forest. These crews also assist with watershed improvement projects across the state. 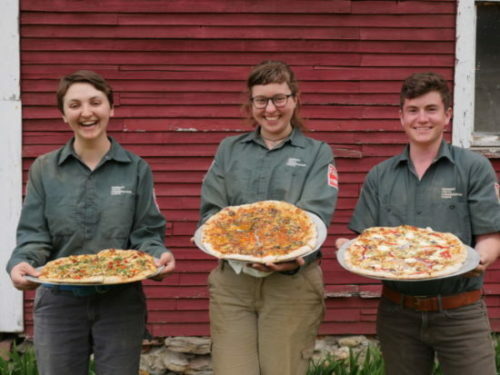 AmeriCorps Members receive a weekly stipend (dependent on total hours), housing, farm fresh food daily, and earn a Segal Education Award at the completion of service. General Spike Crew Members receive an hourly wage of $10.78/hour. We are especially looking to recruit young people from low-income backgrounds. 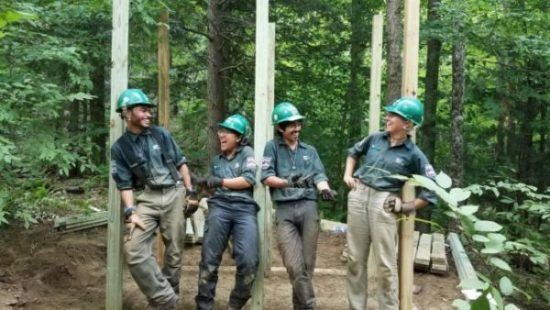 The skills you learn on these crews can ready you to jump into the Vermont workforce with the knowledge you need to join the trades, construction, and other well-paying fields. Ask us for more info about this! No prior experience or special skills are needed. We fully train Members to do this job, which will prepare you for future jobs. Our Young Adult Farm Crews work on our organic farm in Richmond, VT. These crews work in the spring, summer (peer crew or leadership development crew) and in the fall. These crews work together with our youth crews to grow thousands of pounds of vegetables, hundreds of chickens and a bunch of pigs. These crops and animals will be packed into CSA (Community Supported Agriculture) Shares for our community and our award winning Health Care Share (farm to hospital CSA helping feed Vermonters in need). AmeriCorps Members receive a weekly stipend (dependent on total hours), housing (limited, please inquire), farm fresh food daily, and earn a Segal Education Award at the completion of service. We are especially looking to recruit young people from low-income backgrounds. The skills you learn on these crews can ready you to jump into the Vermont workforce with the knowledge you need to join the agriculture, health care, and other well-paying fields. Ask us for more info about this! Young Adult Community Crews work together to learn and practice sustainable agriculture, food-security projects, and complete nutrition and cooking courses. Crews interact with food system and community leaders including farmers with varied operations, suppliers, medical centers, and hunger relief agencies. These interactions expose crews to a variety of future employment options and allow the opportunity to network with professionals in the field. These crews work on our Farm at VYCC during the day Monday – Thursday from 7:45 a.m-4:30 p.m. and head home at night. All Crew Members are AmeriCorps Crew Members, earning a weekly stipend, housing, farm-fresh food, a weekly grocery budget, and a Segal Education Award at the completion of service. Note: The Farm Peer Crew is provided housing on our campus in Richmond. The Farm Peer Crew is comprised of six AmeriCorps Members who live and work on our campus in Richmond. This crew will be part of the Field Staff Team (Headquarter Staff & Coordinators, Project and Team Leads) to help carry out projects associated with the Health Care Share. This our one residential farm crew, who live in yurts or lean-tos on our campus in Richmond. Farm Leadership Development Crew (June 15 until August 15) *THIS CREW IS FULL! 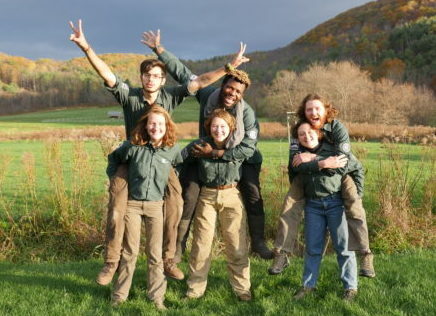 This crew of six AmeriCorps Community Crew Members and two Crew leaders will have a strong focus on leadership development throughout their farming experience. While working on our Richmond Campus farm, this crew will be provided leadership learning opportunities through, specific curriculum and peer-to-peer learning educational components. The Young Adult Spring Crew focuses on prepping the farm beds, planting, growing and transplanting all necessary crops, and preparing the farm for the busy season with the Health Care Share. The Young Adult Fall Crew focuses on the final harvests and deliveries of the Health Care Share as well as closing up the farm for the season. Our Young Adult Spike “camping” Crews live together, camping near a work site and work during the day (7:45 a.m-4:30 p.m.) in Rutland county, along the Long Trail and Appalachian Trail, and in many state parks around Vermont. These crews are both general Crew Member positions (earning a hourly wage) or AmeriCorps Member positions (earning a weekly stipend and Segal Education Award at the completion of service). Between 18-26 years old. You can be 17 years old to work on our Young Adult Farm Crews. Able to join a crew for a full session (8 or 16 weeks or longer!) spring through fall. Email Hans for Conservation or Kyle for Farm.